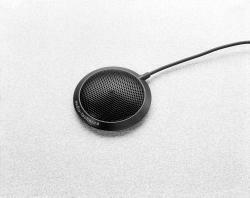 The BM43 is a small, unobtrusive acoustical boundary microphone with a half-spherical polar pattern, which has been designed for round-table discussions, video conferencing, studio and live recording applications. Because of its high sensitivity, the output level can be maintained even when miking from a distance. A built-in rumble (hi-pass) filter eliminates low-frequency wind and interference noise. 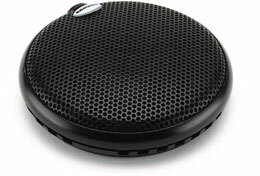 Perfect for use with solid state sound recorders in meeting situations. Please disregard the versions listed on the PDF leaflet. Two exclusive versions are available from us: BM43-BK-XM (black with male XLR termination on lead) and BM-43-WT-XM (white with male XLR termination on lead). 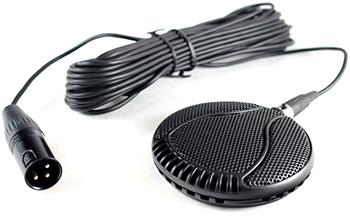 This surface mount CM11B condenser mic has an omnidirectional pickup pattern that captures sound in a 180 degree pattern. Its ideal application would be to place one (for up to 6 people) or two (for up to 12 people) on a boardroom or conference table to pick up the meeting. The microphone's low-profile design assures minimum visibility. It has an internal high-pass filter to control low frequencies (that annoying rumble you get when someone in the meeting bangs the table, for instance!) and it comes with a 30-foot cable terminated with a mini-XLR at the microphone end and a standard male XLR at the recorder end. It requires 9-52V Phantom Power from the recorder. Whilst the CM11B is not as capable as the Beyer Dynamic MPC66 above it delivers a pretty presentable performance at the price - certainly more than good enough for transcription purposes. This surface mount CM10B condenser mic has an unidirectional (half-cardioid) pickup pattern making it perfect for more focussed applications where an omnidirectional mic may be too open (e.g. in noisy environments). It is therefore perfect for oral history or similar interviews when a conventional stick microphone on a table stand might inhibit the interviewee. The microphone's low-profile design assures minimum visibility. It has an internal high-pass filter to control low frequencies and it comes with a 30-foot cable terminated with a mini-XLR at the microphone end and a standard male XLR at the recorder end. It requires 9-52V Phantom Power from the recorder. The E304B surface mount condenser mic has an omnidirectional pickup pattern that captures sound in a 180 degree pattern. Its ideal application would be to place one (for up to 6 people) or two (for up to 12 people) on a boardroom or conference table to pick up the meeting. The microphone's low-profile design assures minimum visibility. It delivers a nice flat, wide frequency response with high sensitivity and no colouration. Perfect for meetings, conferences, lecterns. 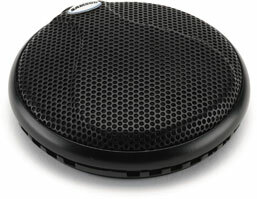 The ATR97 is a low cost electret condenser boundary microphone with an omnidirectional polar pattern. It is useful in surface-mounted applications, for meetings, teleconferencing and desktop use into budget priced recorders equipped only with a 3.5mm mini-jack input socket. In short this is the one to get if cost is your prime concern and only adequate performance is required. The microphone's low-profile design assures minimum visibility. It has an On/Off switch on its bottom and it has a permanently-attached 1.5m (4.9') cable terminated with 3.5 mm mini-jack plug.